We know you rely on your Chevrolet to get you from point A to point B, whether point B is around the corner or across the country. A breakdown can seriously impact your day-to-day routine as well as your future plans. You can rely on our expert service to keep your Chevrolet in the best running condition possible. Along with handling any immediate issues, our mechanics will look for any potential problems that could sideline you down the road. If your Chevrolet needs a repair, whether large or small, we possess the skill and range of experience to handle the repair in an efficient and cost-effective manner. Our technicians will accurately assess the damage to your Chevrolet, and fix the problem based on our mechanical expertise and your input. 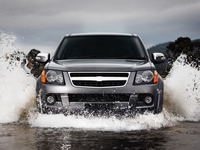 We want to know what you expect from us and your Chevrolet, and then to exceed those expectations. If you live in Amarillo, TX, we are here for your car’s regular maintenance as well as unexpected repairs. We want to keep your Chevrolet on the road for many years to come! Our technicians maintain an exceptionally high skill level, not only by building on years of experience, but also through continuous training. We know that you have many choices when it comes to servicing your Chevrolet; come to our shop, and let us show you why we are a top choice in Amarillo, TX. Call or Visit Us Today for Your Chevrolet Service Needs! Bring your Chevrolet to our shop in Amarillo, TX, fill out our contact form , or give us a call at (806) 418-8155 to make an appointment. You can trust us to service your Chevrolet professionally and courteously, all with the goal of putting you back behind the wheel with a smile on your face.